Bookmark Knoow Blog Now ! 0 What is bounce rate and how to minimize it? When ever a person lands on your webpage or blog and skips off without any activity within a short time span is usually referred as bouncing, and the rate at which users bounce from your blog is known as bounce rate. What are the uses of knowing Bounce rate? The quality of a blog or site is usually measured in bounce rate. So if your blog has a very less bounce rate means your blog is a good quality blog and if your bounce rate is high it means your blog is a low quality blog. So a blog has to always maintain a low bounce rate in order to gain good advertisers or also to get genuine clicks of your advertisements. Even the search engine will rank your blog with a good rank which is a good move for your blog to be indexed above many other competitive blogs or sites. 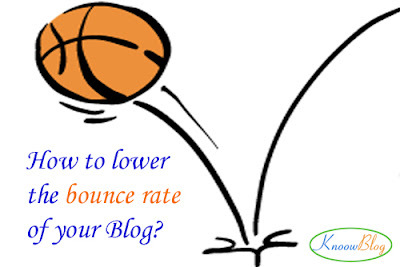 How can one know the bounce rate of a blog? We can know the bounce rate of any blog by visiting Alexa and knowing its traffic details and also its Bounce % or else if it’s your own personal blog you can have an accurate data in your Google analytics account so haven’t got a Google analytics account first have it to know some facts about your blog. You can also know which page has most number of visits. What is the optimum bounce rate for a blog? There is no such thing as an optimum bounce rate but of course each person has his own ideal bounce rate some feel less than 50% is a good bounce rate some feel less than 30%. So bounce rate differs from person to person. You need to set a target for yourself regarding the bounce rate I feel less than 50 % is good less than 40 % is fair less than 30 percent is extraordinary. How to lower the bounce rate? In order to lower the bounce rate, always write articles in an easy language. Don’t go too far beyond using some tough vocabulary. People often skip off the pages if they can’t understand your language. Write some eye catchy titles and mean what you have titled the post don’t write off topic posts always confine to the articles title. Use some pictures which give an indelible impression on users mind to search for more of that sort of pictures in your blog. Try to link some of the words in your blog to some other article so that when ever user clicks it he won’t go off to other site but lands in of the other pages of your blog. Always mention the related articles close to your blog post so that user finds interest to read more and more. Never try to write articles which follow a part time trend like a result of some university will be having good traffic for one to two weeks and also for writing such articles your bounce rate will increase as they always need to be pointed to some third party website. The look and feel of the blog should make the user to stay for more some users skip off by seeing the appearance also so have a good theme and proper sidebar with all useful information. Hope this article has given an insight into how to maintain a good bounce rate and be at top in search engine rankings. So always create quality than quantity. I hate spam just as much as you! 1. Start your Blog for Free with Blogger. 3. Which blogging niche suits me best? 5. How to Build a unique blog? 8. Why does blogger hate your blog? 9.How to write an innovative post? 2. How to minimize bounce rate? Knoow Blog is a simple blog which focuses on various blogging techniques, blogging tips, success stories of people, latest technology developments, top websites and their trends. Hi Guys!!! I'm Vijesh founder of knoowBlog (Know about blogging) a simple blog which serves as an informer and an adviser on various blogs, websites along with few blogging tips and tricks. I write articles to help newbies evolve into bloggers.